Yeah it’s a nice addition. Where’s Peiriannydd these days? Would be nice to get his opinion on how the tower is turning out. I think we have a different definition of nice....I only hope that local land values are growing so fast that the owners will be made an offer they can't refuse! The people that own Rapports have been in talks with a number of developers over the last couple of years. At least I thought that was the case. Did they not put forward a proposal for HMRC or something? If so then it’s clear that their building won’t be there for much longer. It's one of the nicer buildings from that era. I love the lettering. Would be a shame to see it go. I recently had a chat with the owner of Madeira. He seems to think that block, where his restaurant is, is going to be pulled down. I welcome new developments, but if all you're gonna do is knock down perfectly fine buildings that just need a bit of TLC and erect student towers, there's not gonna much be left to see or do in Cardiff. It's happening in London at an alarming rate. Mikey87 wrote: It's one of the nicer buildings from that era. I love the lettering. Would be a shame to see it go. I recently had a chat with the owner of Madeira. He seems to think that block, where his restaurant is, is going to be pulled down. 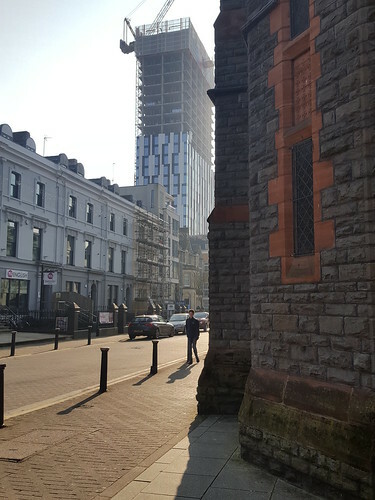 I welcome new developments, but if all you're gonna do is knock down perfectly fine buildings that just need a bit of TLC and erect student towers, there's not gonna much be left to see or do in Cardiff. It's happening in London at an alarming rate. The above might explain why a restaurant called Ty Madeira are taking over the old Louis unit in Saint Mary Street. It could be a relocation. I'm pretty sceptical about that, I'd have thought the Masonic Hall is listed, for a start. Plus Madeira and the Thai House are highly rated restaurants, and Gwdihw a popular bar and music venue. Can't see it happening personally. Wow that would surely be incredibly controversial - especially with the four mentioned!? Now why not flatten the Ibis hotel instead, I'll bring a sledge hammer and join in!! Ty Madeira is indeed connected to the existing Madeira restaurant but it's opening in addition to it. It's going to be a more modern twist on it and have an open plan kitchen. As has happened with at least one other student block, Watkin Jones have applied for temporary permission to house non-students for the first year of operation. The reason given is as follows.